“eMpower” is one of our Web/Intranet based Time-Attendance & Leave Management software product which is designed and developed by our own in-house experienced and qualified software development team under the guidance of our management team. This is customizable, user friendly, proven stable and is compatible with any Time and Attendance/Access Control hardware’s, can be integrated with SAP or ERP or any other customized application software’s. This caters to all the requirements of a Small, Medium and Large scale Organizations / Institutions thereby delivering the desired results that will improve the decision making, streamlines the implementation and accelerates the return on Investment. 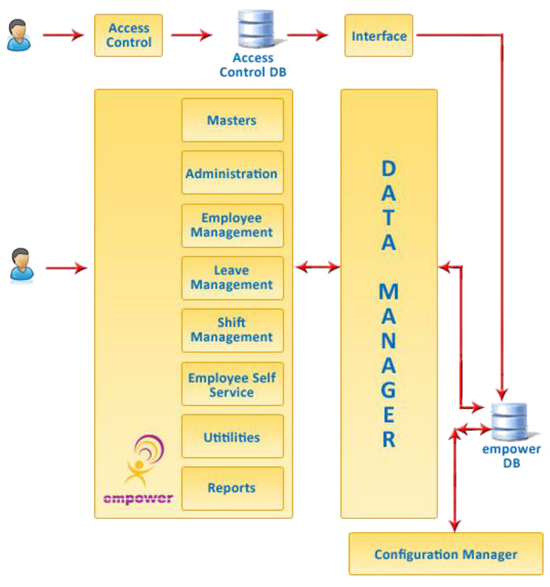 eMpower primarily works as a support system for Attendance Reader/Access Control System. It has a utility to import swipe data from various Attendance Reader/Access Control Systems to its own database. It processes the data and provides attendance/Leave/Out Duty and man hour details of all employees.